Mac users, it's your turn. Take part in the growing ergonomic revolution with the Freestyle2 Ergonomic Keyboard by Kinesis. Split, splay, and tent this handy work accessory for better positioning of the hands, wrists, and arms. You'll increase productivity with its quiet and driver-less hotkeys, giving you time to focus on more important things - your work. 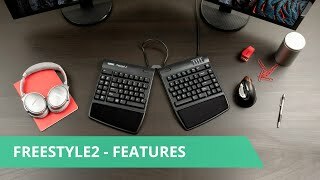 The Kinesis Freestyle2 Ergonomic Keyboard for Mac is available in both a standard model as well as the extended version. The standard Freestyle2 for Mac keyboard features 9 inches of separation, which works for most users. The extended Freestyle2 for Mac offers 20 inches of separation between the split keyboard halves, and it works well for users with very broad shoulders or for someone who would like to angle their keyboards up to 90° with the Ascent accessory. With the Kinesis V3 Accessory Kit, tent the Freestyle2 keyboard for Mac to 5, 10 or 15 degrees. The V3 accessory tents the two split keyboard halves without the palm rests. The V3 can be used with or without the optional tether. Excellent keyboard. Very confortable ehen used with the VIP accesory. I just received the unit today, assembly was very easy and I'm loving the ability to space out my hands. I've looked into seperated keyboards because of my wrist problems, and it's amazing how the high tenting and the spacing really helps alleviate strain. Also, the mac hotkeys are great, many ergonomic keyboards don't come with mac options so this keyboard wins the token. Highly recommend! Also, the action of the keyboard is quite nice, it's amazingly easy to type fast due to the low 45g key action. Still not mechanical cherry switches, but pretty darn good. This product is fantastic and after only a couple of months using the keyboard the pain in my wrists has virtually subsided so mission accomplished. The only things that prevented me from giving 5 stars are the following: 1) The picture on the website is a little misleading as it suggests that the keyboard is wireless, however it is not a wireless keyboard. 2) If the colour of the keyboard was white and silver to match the Mac iPad that would be awesome. Well constructed, very user friendly, comfortable. I have "tennis elbow" and keyboard a lot. This keyboard is just fantastic for reducing the pressure and tension on my wrists and theyefore, elbow. What was especially cool for me was that I wrote the company, requesting advice, and I got a prompt and friendly response that was very informative and helpful. Great product; solid company! Right on! All things considered, I think it's a pretty good keyboard. - Key action is awesome. So much easier to press the keys than my old MS natural elite. - I've been having less RSI issues with this keyboard. (To be fair though, I have done a lot of things to help with my treatment so I can't say for sure that this keyboard did the job). - I have one major con that irritates me on a daily basis. I bought the mac version of the keyboard and the function key only supports a full toggle rather than behaving like all other osx keyboards. It locks, and doesn't obey the os setting for making it behave differently. This may seem trivial, but it is extremely annoying because I use the function keys in both modes quite frequently throughout the day. Even more irritating is the company response to this in that they believe the existing functionality is "better" and are relatively dismissive of the idea that it should work like other OSX keyboards. My response from technical support was that they feel it's better like this and that they hope I get used to it. I'm giving this 4 stars because I don't know of anything equivalent that has a properly functioning function key. Otherwise I'd rate it much lower and switch in a minute. i love it. no more wrist and hand pain. i did get the separator so that my arms are straight and the accessory that puts the "hill in the middle". I bought this because I had RSI in my wrists. It was a little difficult to get used to but after about a week I had it down pat. I found that it did not really help my RSI too much, the vertical mouse and a Wacom tablet seemed to do the trick. I still think it is a really good keyboard though and just because it didn't work for me so much doesnt mean it won't work for someone else. $98.00 List Price: $109.00* The list price is the same as the MSRP (Manufacturer's Suggested Retail Price). It may not necessarily be the price at which the product is sold.